The final installment of my festive gift guide bonanza is a biggie. Bespoke hampers for your bestest friends. Time is ticking and I’ve slicked together three hampers filled with five treats for varying tastes and budgets, alongside simple shopping links, and they’re oh so simple to put together. Just set aside a Sunday evening, pop Elf on and get building. And who doesn’t like dustings of confetti, panes of cellophane and wicker baskets?! For the homely and creative sort, this hamper boasts a little notebook and coloured pens (ideal for blog notes, by the by!) as well as a little illustration by Carly Watts to adorn the walls, and an ice-cream shaped nail colour from Etude House. Of course you can replace with even more affordable options, but these combine for a lovely rustic, homemade feel. For the best friend who loves a good night in or never seems to get a moment to pamper herself, this hamper is perfect for chilling out and upping the beauty stakes. Start with a homemade Costa coffee and luxury chocolate, and then treat her to some new lipstick and a luxury CHANEL nail colour, just for the packaging alone. Started a new job and want to treat your best friend, secret confidante, partner-in-crime and sister from another mister to something special? This is a seriously luxe kit. Starting with a Lulu Guinness cardholder to store ID, credit cards, business cards, etc. this is a sweet little gift with plenty of personality. A YSL Rouge Volupte is pretty classic and looks so gift-worthy. 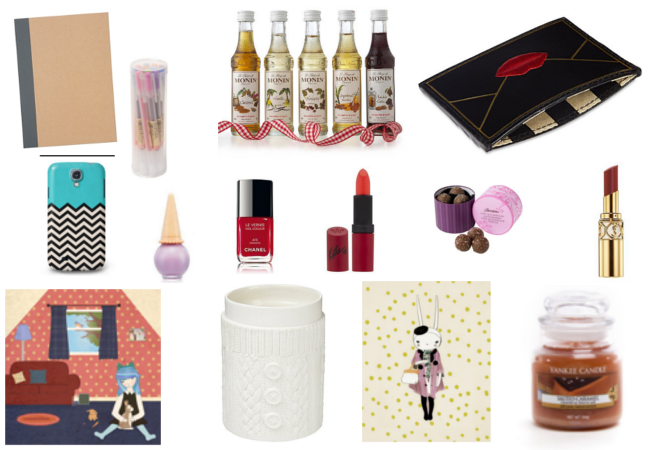 To finish off, a Fifi Lapin print, candle and truffles will complete her holiday season.